YouTube Track Manager in conjunction with the foo_youtube plug-in enables streaming content within foobar2000. Tracks can be chosen based on what’s popular or albums selected using last.fm and MusicBrainz discographies. If preferred you can prioritise playing your own music over adding YouTube links. Click tracks or albums to load. YouTube links can be played as audio only or as video. YouTube Track Manager also offers auto-pick radio modes for artist, genre, similar artists and similar songs playback. 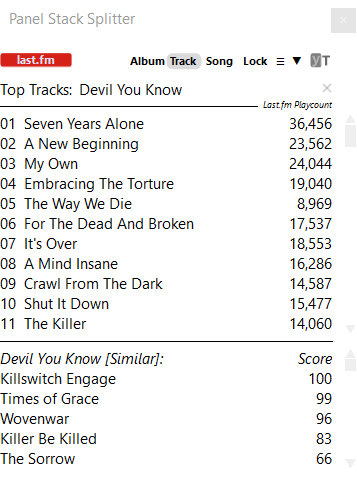 These use track popularity data from external sources (last.fm + echonest) or your own data (media library radio). A nowplaying panel (toggle display with yT button) shows artist, cover & YouTube pictures and provides track & radio mode info. Mouse left click toggles display type. 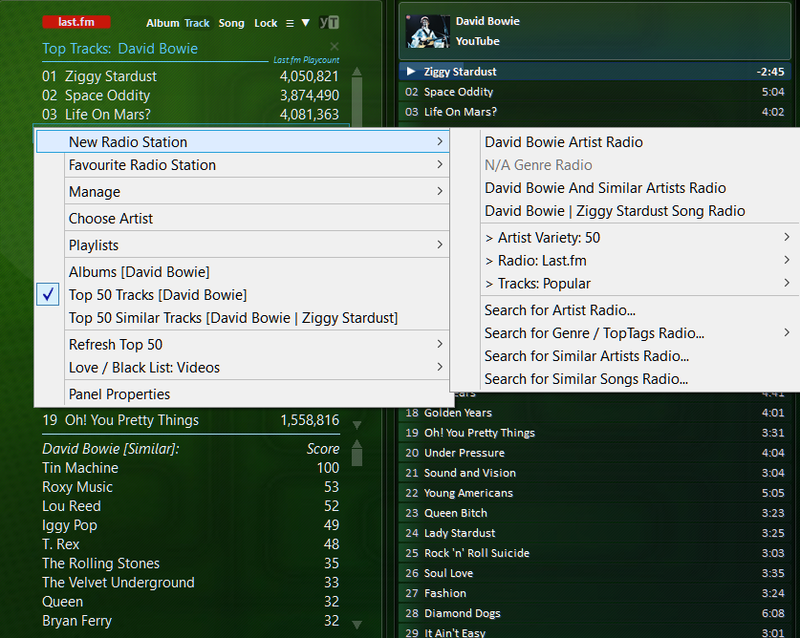 The nowplaying panel can be set to image only (mouse middle click) so it acts like an albumart viewer for any music, if no longer wish to look at lists etc. It can also cycle through multiple artist images. See the readme for full info. m-TAGS enables automatic generation of m-TAGS files using album track lists from MusicBrainz and last.fm. If the foobar2000\yttm\albums folder is added as a monitored music folder in preferences\media library the albums will show in the media library. This process can be enabled/disabled at any time. Playback statistics (foo_playcount). This is recommended for optimal performance of the media library radio. The media library radio also works best where you have a reasonable number of tracks to pick from (nowplaying panel shows pool size). The versions of these components required, and any requirement changes, will be kept up to date in the download link location. Installation: Add a JScript Panel to the layout in the usual way. Click the JScript panel (or right click and choose configure) to open the editor. Use the tools button to import the YouTube Track Manager script. Finally, it is recommended to optimise settings under foobar2000\preferences\shell integration : (1) Uncheck "Bring to front when adding new files" to ensure that foobar2000 does not grab focus away from other applications. (2) If the default %path_sort% is present in "Sort incoming files by:" change it to something better like %album artist% - %album% - %tracknumber% - %title% to ensure album tracks are loaded in the correct order. Always check near to the end of this thread for the latest download link. I'd like to know how I can reduce the "Left" border width. I noticed that the border parameter in panel properties is about "Top' border width. I use this YouTube Track Manager in the panel of somewhat narrow width. So, I want to use the whole panel width as YouTube Manager width. 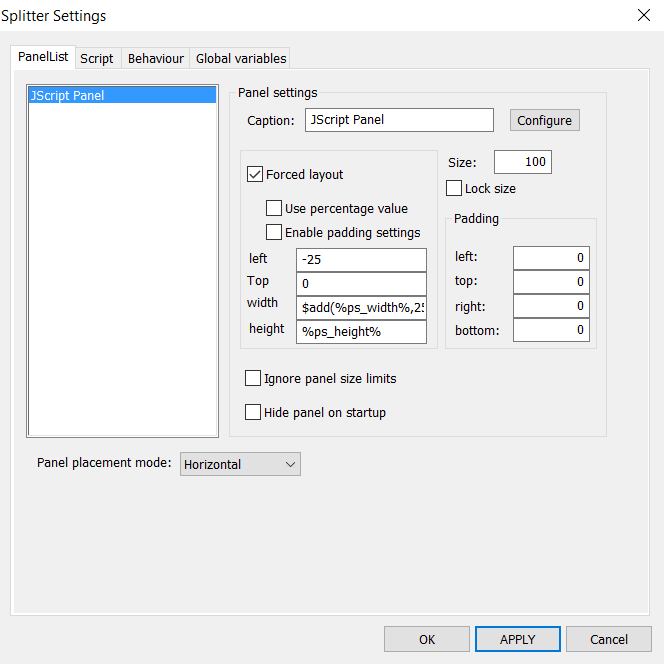 If you are using ColumnsUI , use Panel Stack Splitter with a Forced Layout. Thank you for your help. That is enough for my usage. I'm using DUI. When I use CUI, I'll try your suggestion. Thank you. search string by last.fm:- "Alesso - Heroes"
to look for this slimier tracks so we can guarantee a result. Simplest solution for local file matching is to just split the artist and title name, so as to remove the unwanted extra info that's causing the match to fail. This is best done with regex since it's past titleformatting. Thus the core name will be the part of the name preceding the split, e.g. "The Real Thing [Wendy and Lisa Flow Jam Mix]" becomes "The Real Thing"
"Rich Girl (feat. Eve)" becomes "Rich Girl"
You can edit it by adding more etc. Note that special regex characters have to be escaped, e.g. Its case insensitive and is subsequently trimmed of spaces. Set Library Use Core Names as needed. Note that the code snippet doesn't affect album track loading in its current form. Also the artist is checked once for either the original name or, if Library Use Core Names is set to 2, the split name. Running artist queries more than once adds too many permutations. Title is checked 1st for the original library name and if there is no match it is then checked for the split name. Since mostly last.fm seems to manipulate the title probably setting Library Use Core Names to 1 is best. Note that I haven't extensively tested it. To use replace the whole of "this.in_library = function ...", lines 282 -290 with the snippet below. You can tweak it further so it best suits your needs. For the other point regarding "Unrecognized song", I thought that's why you requested the title-format options that I already added for you - since these determine what artist - title is actually used for the look up at last.fm. So its up to you how you use title-formatting to manipulate the look up. I am not keen on sending a second request to last.fm with an alternative spelling that may or may not be any better. Autocorrect is already used so simple differences are handled. Consider choosing tracks where you want similar songs carefully. Thanks for this WilB !! can i do this by RegEx?? Added option to properties: "Library: Include Partial Matches 0 or 1" with separate settings for artist and title (set to 1 to enable). The partial match criteria can be configured in properties with "ADVANCED.Partial Match Config" - see read me for details (search for reg). Fuzzy matching and/or RegExp clean-up are available. The song name is now directly editable, so extraneous info that could be in the auto-search name, e.g. (feat. artist), and that might result in "Song Unrecognised", can be removed. Use | to separate artist and title. Is there some way python script and foobar2000 can communicate ?? ^ Sorry but I can't help on this occasion. Thanx for 2.8. - and the very informative Read Me file! Music recommendation is now powered exclusively by last.fm, following the demise of the Echonest api. The listening habits of millions of music lovers are analysed to help you find your new favourites. Loads YouTube links (audio only & video) or available library tracks. This avoids YouTube links and uses your own track popularity data in conjunction with in-built algorithms to auto-pick tracks. Offers single artist, genre/top tags and similar artists styles of playback. Added item to right-click menu to get the UK top 40 singles chart. Loads YouTube links etc into a playlist. The on-line chart source employed updates weekly on Fridays after ~1900 UK time. If YouTube links loaded are not to your liking, then the main foobar2000 context menu\Youtube Source has options for replacing them with other links. Alternatively, YouTube Track Manager can black list them to permanently stop particular links from being reloaded by the script. Fixed regression in album mode. This is really fantastic, thank you. I agree - it is a fantastic plugin!! 1. add an optional additional filter for the selected youtube titles. I found that the chosen youtube tracks vary strongly with their sound quality (from cd versions to live versions with 'improvable' sound quality). This reduces fun when I just use it as a radio. Of course the question is which available parameter would correlate to sound quality... I think two ways could improve the selection: one would be to set a minimum number of youtube views (e.g. 100k) - as I found that poor sound quality often has less views- , another would be to exclude tracks with specific key words in the youtube description (e.g. 'live'). 2. as I do not rate my library tracks - is there the possibility to have a Last.FM-selection for tracks purely from the library (which of course would mean to jump to next Last.FM proposed track until available in the library)? But again: I really love it already as it is! That's such an amazing script ! Thank you very much WilB. However, I have a question, I'd like to create "similar artists Radios" using only my own music library, exept for bootlegs (because of the usualy poor quality). In order to pick only local tracks, I used properties to change SYSTEM.Library Radio to "true". It seems to work fine (guess I was lucky). However, so far, I could exlude bootlegs tack. Is there a way to do this ? All the bootleg tracks have a specific tag (%BOOT% tagged with 'Bootleg") so I guess I have to find a way to exclude all the tracks from my library including the %BOOT% tag. Any help would be greatly appreciated. Thanks ! Three modes are now offered. The mode is set using the right-click menu: "New Radio...\> Radio..."
(1) Set "New Radio...\> Radio..." to "iSelect / Save Soft Playlists"
ADD: New panel properties of "Nowplaying Font" and "Nowplaying Font Max Size". These together with "Image Size.." & "Border" settings make adjustment easier. 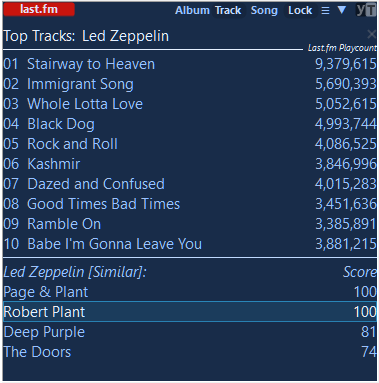 ADD: Configurable radio names for "Last.fm Radio", "iSelect Radio" & "MySelect Radio"... personalise as required in panel properties: "Radio Names..."
With the "MEDIA LIBRARY FILTERING" feature, I could exclude tracks coming from bootlegs (e.g : demos, lives...) from the library copy used by YouTube Track Manager . It's just great ! I'm sure many users will find this feature very useful, even if they don't have bootlegs in their music collection ( for instance, you can use "MEDIA LIBRARY FILTERING" in order to exclude official live recordings). Thanks WilB ! I'm very grateful you include this in your script !! (BTW sorry I posted my last message on the wrong thread).